I have been the proud owner of a Ms. Pac-Man arcade cabinet for about a year and a half now. I really like it. I have been playing this game for decades, really. I heard about this game before it was released on the arcades, and when I finally saw it, I admit it was a little disappointed. It looked like "Pac-Man with a facelift," so to speak. The only change I saw was that the color scheme of the game appealed more to women. As time went on and I watched and played the game, I realized it had several small differences which added up into a game significantly better than Pac-Man. The game had four different mazes instead of the one maze Pac-Man had. The fruits moved around the maze instead of staying on one location like they did on Pac-Man. Finally and more importantly, even though the monsters have basically the same artificial intelligence as in Pac-Man, they have been programmed to make a random move once in a while. That means there are no patterns in Ms. Pac-Man. That greatly increased the longevity of the game. In Pac-Man most advanced players end up using patterns because the monsters move the same way every time. In Ms. Pac-Man you have to improvise and it's never the same game twice. Since I loved this game so much and it became my favorite video game of all time, I always wished on the back of my mind that I could own it. And I did own it and played it countless times on several platforms: the Atari 2600, the Genesis, the Game Boy Color, and the Game Boy Advance. When I discovered Mame on the late 1990s I started playing it on my Mac thanks to Mame. However, I always wished I owned it as an arcade cabinet, its original platform. Nevertheless, all through my 20s and 30s I never bought the Ms. Pac-Man arcade cabinet I always wanted. In part because I could already play this game. Mostly, however, I believed there were other things more important to me at the time, like my education, my career, and saving for my retirement. Eventually there came a point on which I said "Wait a minute, I'm almost 50. I wanted a Ms. Pac-Man arcade cabinet for a long time; how much longer am I going to wait? I don't want to wait until I'm 70 to get it. And I have the money now." So I started searching for one. Before the search I measured the dimensions of the stairway that goes to my house. That's when I realized the original large and blue Ms. Pac-Man would not fit through the stairway. The cocktail cabinet would fit. However, if I took it home it would take more floor space since it needs space for you to sit on in order to play it. Once you finish playing with an upright cabinet, that floor space is free again. That was very important to me since my space is very small. That meant the best option for me would be a small upright arcade cabinet, also called a Cabaret arcade cabinet. Sure, it is more expensive than the larger blue one, but like I said, space for me is at a premium. Also, when I went to the California Extreme (an arcade video game convention) I played with a Cabaret Ms. Pac-Man and I fell in love with it. The smaller size of its monitor actually made its graphics look better. At the time on which Ms. Pac-Man was released, its graphics were very good. Now, however, you can have much better graphics on your phone. Since the Cabaret Ms. Pac-Man has smaller pixels, its graphics look better to me than on the original, larger arcade cabinet. 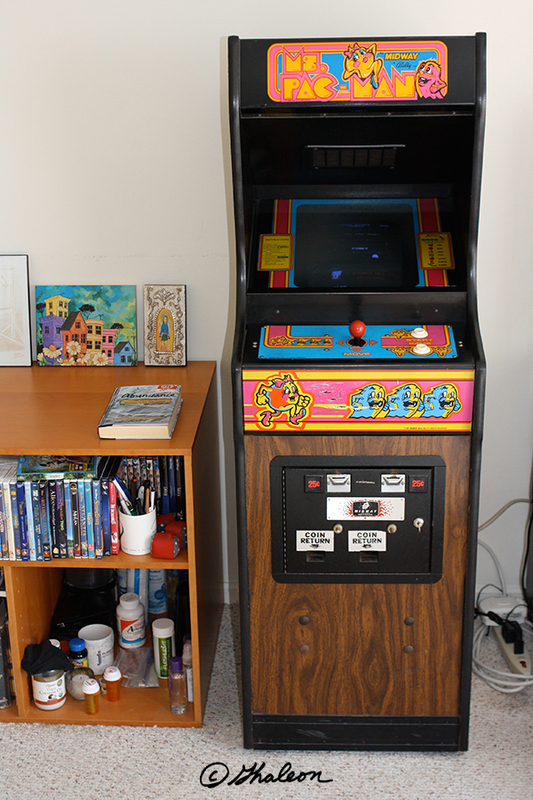 The Cabaret Ms. Pac-Man is the rarest of all three models, so it took me a while to find a cabinet like that available on Craig's List. As I communicated with the seller, though, I started getting the feeling buying it from him would not be a good idea (basically, he didn't want me to play with the cabinet at his house before I bought it). So I went to a forum for people who collect arcade video games and I posted in the "Wanted" section an ad for the game I wanted to buy. I was rather surprised when a man with the exact same arcade cabinet I wanted offered to sell me one the very next day. And he kept it at his work in the same city I live in, so he allowed me to play it before I bought it. I did and I did. The transaction went very well: he was friendly, his price with within the range of what I said I wanted to pay on my ad, and he delivered it to my home. After he left and I set it up the way I wanted it (I wanted the default settings and he had the "fast" Ms. Pac-Man) I played it six or seven times that day. I was starting to get carpal tunnel syndrome, so I forced myself to only play it once a day from now on. I was a little bit afraid ever since I started my plans to buy the cabinet of the possibility of me being disappointed with the purchase after I got it. After all, I have already played this game to death. I was hoping instead I would feel relief once I got it since I finally fulfilled a dream that I had. And indeed I did feel relief. However, I also felt another emotion I did not expect: I felt that this machine has always been with me. The day after I got it I began to feel that, and I still do. That was weird because obviously I never had it before. But this feeling of belonging and peace made me more sure that I made the right decision. Yes, I still play with my Ms. Pac-Man on a regular basis. I don't play with her every day, but I play with her several times a week. I have gotten a little better at that game since I got the arcade. I now reach most times the third or the fourth brown maze, and I reach the Junior intermission about 25% of the time. That's not as good as I wish I were, but I already play better than most people. Most people lose their last life on the pink or light blue mazes. Am I sorry I didn't buy my Ms. Pac-Man arcade cabinet earlier? Not really. I can see why I didn't. Would I buy it again? Absolutely.